In 2003, a study from the University of Minnesota showed that eating dietary ginger may slow down the growth of colon cancer cells. Eating ginger has lots of other benefits, including helping with migraine relief, morning sickness and more. Need some ideas for recipes containing ginger? Here's a list of 29 ginger recipes. In recent years, researchers continue to discover more and more about the link between bacteria in the body and overall health. For example, taking good care of mental health helps keep the gut health and vice versa. Healthy gut bacteria also may impact weight, cholesterol levels and other things related to a healthy heart. Getting 7-9 hours of sleep per night is really good for a person's health, as discussed in this infographic. A solid night of sleep helps people regulate weight, stress and life much better. Now there is evidence sleep can even help cancer patients. A new study found colon cancer patients who slept well had a higher chance for surviving cancer. Some people need a cup of morning coffee to be a functioning human being and new research suggests its a good habit for colon health. In fact, regular coffee drinkers reduced their risk for colon cancer by 26% compared to non-coffee drinkers. This is a guest post written by Jim and Caroline Vogel. Jim Vogel and his wife, Caroline, created ElderAction.org after they began caring for their ailing parents. Through that rewarding and sometimes difficult process they’ve learned a lot about senior care and specifically the need for more effective senior mental health and support. Their site offers elder-positive resources and other helpful information on aging. In his spare time, Jim loves fishing, reading, and spending time with his kids. Learning about a cancer diagnosis can be an incredibly overwhelming experience, but it’s what you do afterwards that can make all the difference for the road ahead. Learning about your condition, staying engaged in day-to-day life, and connecting with others are a few ways you can begin to cope with your diagnosis. 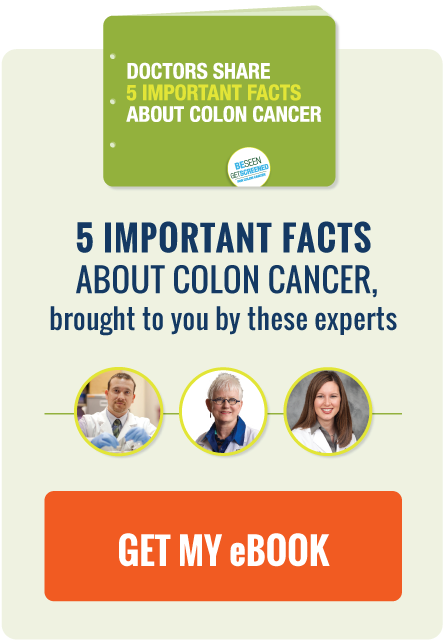 In the United States, colon cancer is the third most common cause of cancer death. Yet if people get regularly screened, colon cancer is one of the most preventable cancers. As the infographic shows below, early-stage colon cancer is very treatable. And now colonoscopies aren't the only option: USPSTF recently released new guidelines and said to choose a screening method that works for an individual's lifestyle. Most people know heavy drinkers have an increased risk for cancer, including colon cancer. Normally, people wouldn't think twice about sitting down for a beer and a well-deserved hour of a favorite television drama. Turns out even the average American who consumes one drink per day is increasing their risk for cancer. "Omega-3" may sound like a name for a spaceship or perhaps Apple's next operating system, but Omega-3s are actually a fatty acid that are the building blocks for all fats in your body. They also have some serious health benefits. Omega-3 fatty acids reduce risk factors for heart disease by decreasing the amount of bad fat circulating in your blood. They're also really good for your eyes. Basically, taking Omega-3s will only improve your health. It's pretty common knowledge that meditation positively impacts your health. It reduces stress, increases emotional wellbeing and many other benefits. But what if meditating also helps cancer survivors? A study from 2014 found that cancer survivors who meditate and do yoga for 45 minutes per day caused their cells to change structure and live longer. That's really exciting stuff!